17 November 1918 was a milestone for the city of Fiume/Rijeka. On that day, Italian troops, along with a few American soldiers, entered town. For the local Italian National Council—established at the end of October—and its followers, the event symbolized national liberation. As Il Giornale, a (formerly) moderate, Hungarian pro-government, Italian-language daily soberly printed on the front page: “The ironclad Latin will, the fervent love of Fiume for the Motherland, the firm battle sustained, the lively flame that for centuries fed our people triumphed yesterday.” Next year that date was inscribed on the urban landscape when the boulevard that lead from the railway station to the city center, previously named “Viale Francesco Deák,” was renamed “Viale XVII Novembre.” Visually, the Hungarian-Habsburg presence was replaced by a reference to the date of (local) national liberation. By contrast, the local Slovene, Croat, and Serb National Council—also established at the end of October—along with the South Slav nationalists, obviously saw the Italian army’s entrance as a national defeat. 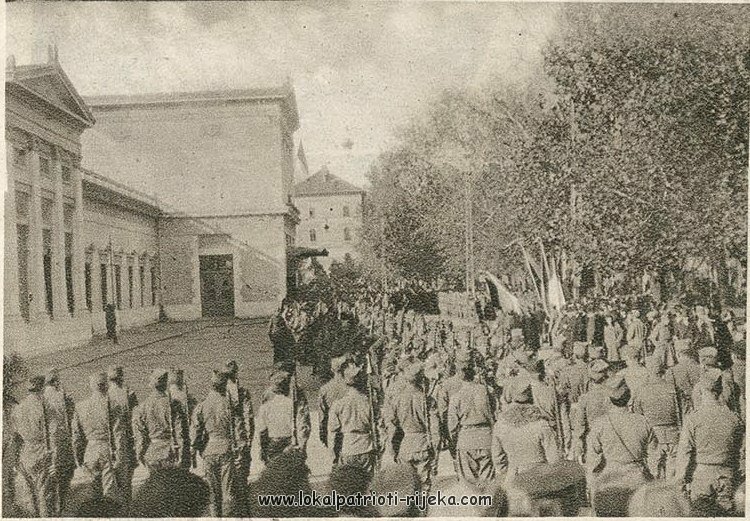 If these groups had been “liberated” by an army, it was two days earlier, when Serbian troops were welcomed into the city with flowers and the singing of the Serbian royal hymn. On 15 November Serbian forces were welcomed as “our brave knights” by the only local Croatian-language daily, Primorske novine, the same newspaper entitled their 19 November issue as “Italians Occupied Rijeka.” The Italians were viewed as “occupiers” because the Serbian presence was short-lived: following Inter-Allied higher orders, and after negotiations with Italian occupation authorities, Serbian troops had abandoned Fiume/Rijeka before Italians troops arrived. On the edges of these divergent interpretations of national liberations stood the political considerations of the local socialist party. The same day that Italian troops came into Fiume/Rijeka, the International Socialist Party of Fiume organized a public meeting. The speakers included Samuele/Sámuel Mayländer (Siófok, 1866–Fiume/Rijeka, 1925), Giuseppe Quarantotto (Pola/Pula, 1889–Fiume/Rijeka, 1939), Stjepan Turković, a representative of the Social Democratic Party of Croatia and Slavonia, and Pietro/Pétér/Petar Kemper (Nagykikinda, Kikinda, 1881–Fiume/Rijeka, 1953). 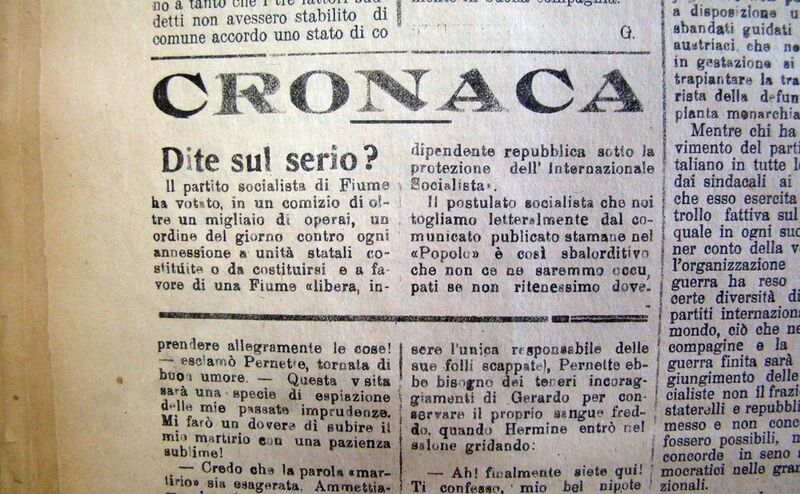 After speeches in Italian, Croatian, and Hungarian, the members voted forward an agenda that demanded that Fiume/Rijeka become a “free independent republic under the protection of the Socialist International.” While the aforementioned daily Il Giornale simply reported brief news about the meeting, La Bilancia, an Italian-language daily formerly loyal to the Kingdom of Hungary and now an Italian nationalist paper, criticized the socialists’ political conduct. The paper ran an article entitled “Are you serious? (Dite sul serio? ),” which provides insight into the complicated political situation and existing options for the political organization of the city. Further, by an attempt to stress Fiume/Rijeka’s local variant of Italian nationalism, the article shows that loyalty to an imagined Italian nation-state was not so consistent as Italian nationalists would claim. The socialists’ request for an independent republic was labeled as “astounding (sbalorditivo),” but the issue was not neglected. In fact, the author shows, given this decisive moment of “our political life” that does not allow for divisions, a need to enlighten the “obfuscated minds of our best workers.” In the nationalists’ minds, workers were included in the national community but, according to the nationalists, they were not completely aware of the political situation. The patronizing attitude towards local workers is further evidenced: The workers don’t have and didn’t have the opportunity to create a political culture that would allow them to decide, with needed competency, on such issues in such a serious moment. The existence and the effort of the Socialist Party, organized in town since 1903 and with an elected city councilor during the Great War, was simply neglected or erased by the author of this article. Advancing alternatives to the city’s annexation by Italy was a sign of incompetence and ignorance in the author’s view, and not a concrete and valid political claim. However, discrediting political opponents as amateurs was not enough. An additional element had to be added to the national discourse: the sense of security and fear of a foreign enemy invasion. Recalling the timeframe—from 30 October to 17 November—when the policing of Fiume/Rijeka was mainly assumed by former Habsburg Croatian military units, the article questions the idea of brotherhood between workers of different nationalities. After the days of Croatian occupation, and “after insolent Croatian national agitation that incited hate and violence without restrain and openly to prepare to conquer ‘Italian Fiume’ with armed force,” mere common sense would be enough to lead any sober person to support the annexation of the city by Italy. The concept of the free republic had to be abandoned due to the existing Croatian menace. For the author, Croatian (or, more broadly, Yugoslav) greed is not drowsy and “tomorrow as yesterday it will be necessary to rely on a large or respected state unit.” Fiume is not San Marino, a territorially uncontested city-state, but a big see port and industrial developing town that the socialists will not be able to protect. Using fear to maintain and defend Fiume’s Italian character, an argument was developed that counterposes alleged Italian progress and civilization against Croatian/Yugoslav backwardness and/or former Habsburg militarism. On one side, socialism, as an ideology, was recognized as having some positive elements as in the case of the Italian Socialist Party. On the other side, the Croatian workers’ organizations were underdeveloped and unable to limit the cupidity of Yugoslav imperialism and militarism. Due to their political weakness, the Croatian socialists were unable to restrain a scattered Yugoslav army led by former Austrian officials from planting the militarist tradition of the Habsburg Monarchy into the new Yugoslav state. Further, cooperation between socialist parties across small states or small republics would not work as well as cooperation inside large national units. For the author, annexation by Italy was in the interest of international socialism and its higher ideals as well as the interests of the local Italian nationalists. Finally, the article addressed economic arguments. Since Fiume/Rijeka is a large sea port and an important industrial town, it wouldn’t develop well as a small city-state because capitalism would produce rivalries and greed that neither the Socialist International nor a future League of Nations could solve. A pure and simple annexation by Italy corresponds to the economic benefits of the city: only a large, strong state could find the necessary elements to fulfill Fiume/Rijeka’s full economic and commercial development. By criticizing the socialists’ agenda, the Italian nationalists showed that state alternatives to a mere annexation to Italy were valid and considered realistic by the local population. The fact that the multiple weaknesses of an independent state had to be presented to the public was an admission that such ideas circulated. The former Hungarian presence, the multinational and multilinguistic practices, the economic bonds with Habsburg lands and multilayered loyalties did not vanish overnight. The choices between a South Slav State, Croatia, and Italy were thus not obvious options. Fervent love for any motherland had to be instigated by economic and civilizational arguments as well as by fear of “foreigners” and promises of security. Thus, an independent republic was not an astounding option, but rather an expression of the composite political vision of the local socialists and their ability to combine and condense the political languages of Austromarxism and Hungarian social-democracy into a concrete policy option that refused to simply abandon the Habsburg Empire’s economic and political framework. In the same article, the socialists at the meeting were skeptically estimated to be over a thousand, hence their opponents recognized that the socialists did not have only a few followers. Therefore, the socialists were taken seriously: their numbers and the arguments behind their political agenda suggests that they were perceived as a real threat to Italian nationalist claims. “La ferrea volontà latina, l’ardente amore di Fiume per la Madrepatria, la tenace lotta sostenuta, la viva fiamma che alimentò da secoli il nostro popolo hanno trionfato ieri”. In “La memorabile giornata di ieri. Lo sbarco e l’entrata delle truppe italiane a Fiume”, Il Giornale, 18.11.1918, p. 1. Daniel Patafta, “Privremene vlade u Rijeci (listopad 1918. – siječanj 1924. )“, Časopis za suvremenu povijest, br. 1, 2006, p. 202. “Dobro nam došli vitezovi hrabri“, in Primorske novine, 16.11.1918, p. 1 and “Talijani okupirali Reku“, in Primorske novine, 19.11.1918, p. 1. “Dite sul serio?“, in La Bilancia, 19.11.1918, p. 2. “(…) non ce ne saremmo occupati se non ritenessimo doveroso rischiarire le menti offuscate degli operai nostri migliori in questo momento decisivo della nostra vita politica che non annette (sic!) scissure.“, in Ibid. “Perché se anche l’operaio non ha e non può avere l’opportunità di farsi una cultura politica che gli permetta di decidere in questioni di così grave momento con la dovuta competenza (…)“, in Ibid. dopo l’agitazione sfacciata del nazionalismo croato aizzatore all’odio e alla violenza fino a prepararsi senza ritegno e senza mistero a conquistarsi Fiume Italiana con la forza delle armi“, in Ibid. “a conservare la propria indipendenza domani come ieri sarà necessario appoggiarsi a un’unità statale grande o rispettata”, in Ibid.